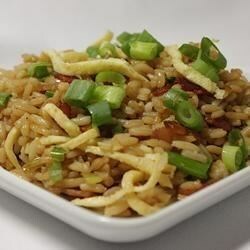 "Here's the perfect way to use leftover rice--fried rice with bacon makes a quick weeknight meal, and it's ready in just minutes." Cook bacon in a large skillet over medium heat until crisp. Move bacon to the side of the pan; add egg and scramble. Move egg over and add green onions to the skillet; saute for about a minute. Stir in the rice, add garlic and soy sauce. Toss until mixture is well blended and heated through. Kick up the flavor on your fried rice with a spicy infusion of kimchi. Didn't love it, but still ate it. I've never had fried rice with bacon before... it just seemed not right to me. Delicious, fast, and easy. Possibilities are endless with what you can add to it. We liked this, but thought it could use another egg & a bit more soy sauce. Still great, thanks for the recipe!